"Did you know that research suggests that some women expose themselves to over 200 chemicals a day through their personal-care products alone? In the US, the National Institute of Occupational Safety and Health reported that 884 toxic substances were identified in a list of perfume constituents. ... Perfumes are completely unregulated and many of the toxins they contain are known to be carcinogenic and can cause birth defects, central nervous system disorders and allergic conditions. They are absorbed through the skin and can accumulate in the major organs." Martin J Walker in “Home Sickness”, published in the Ecologist. Theoretically, natural skincare is an easy thing to do - wash yourself properly with soap, if your skin feels dry apply a bit of simple cream, brush your teeth and you're done. To modern women (and many men), this is unthinkable. What about our hair, they scream, and what about the delicate skin around our eyes? Let alone the BO! A clever advertising industry is making gazillions by telling us that we have problem zones and damaged hair, that ageing is something that has to be (and can be) stopped at all cost, and that we stink to high heaven. It's a waste of valuable time to care about imaginary problem zones; our hair wouldn't be damaged if we didn't use industrial-strength shampoos in the first place; and we know for sure that we can't stop ageing. Of course, it's the advertising industry's job to tell us these porkies, but the worst thing is that we believe them. We really do believe that certain creams can make our wrinkles disappear. That we can shampoo, condition, colour, mousse, gel and spray our hair without doing any harm. That we can "feed our skin" by applying lotions and potions. That we need a whole battery of absurd products like sculpting mud, cuticle oil and female hygiene spray. We obediently spend a fortune and clutter our house with pottles and tubes and cans full of strange-smelling chemicals we know nothing about. If you want to give something for Christmas that will make someone you love feel truly better, why not give them a book on how they can make their own lotions and potions? 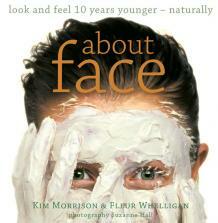 There are heaps of them, for example About Face, which is a homegrown book on natural skin care by Kim Morrison and Fleur Whelligan. The authors believe in an allround-approach to better health, which automatically leads to glowing skin. In their book they recommend a healthy attitude - healthy food and a healthy body - as the best way to maintain our natural beauty. Beyond that, the book is packed with information about how our bodies change with age and what to pay special attention to at life's different stages. They talk about natural skin care products and the questionable ingredients in "normal", i.e. chemical, products. Readers will find facts about sleep, antioxidants, spiritual wellbeing, stress, good food, different personalities, aromatherapy and many other truths related to beautiful skin. Most of all, the authors want to motivate us take better care to ourselves - mind, body and soul. They even put together a 28-day programme to change to a better, healthier lifestyle. The program is sound advice for everyone who wants to fight fatigue, flush out toxins and get rid of some health and skin problems. It challenges to drink lemon water in the morning, exercise moderately every day, brushing and massaging your body daily, drink plenty of water, detox by following a varied, natural diet (recipes are included), cut out coffee, tea, fizzy drinks and technology foods and change from chemical to natural skincare products. All this is explained comprehensively and packed into easy step-by-step instructions that can be followed even by people who think they're too busy to follow a certain regime. To make it even easier, the program includes relevant recipes from skin repair oil and hair rinses to fruit smoothies and natural household cleaners. About Face is a small book with potentially life-changing content.